• Kayla Cardinal - Kayla is 17 years old. She is from Prince George. Kayla struggled with her own journey through addiction involving crystal meth, and has been off meth for 16 months as of November 2006. After making the choice to go to detox, Kayla became very involved with this type of work because it allows her to explore and express her beliefs in a safe environment. She believes theatre is very powerful, and wants to use her experiences in life to help people to see the truth about the issue, and she hopes people will take this opportunity as a chance to learn. Through her journey with theatre, Kayla has become very dedicated to this work. She gives thanks to David Diamond and all the Headlines staff, Street Spirits, Future Cents (her work), and all her friends and family for being so supportive and making this all possible. • Jordan Fields - Jordan is 27. He grew up in an adoptive family inside what was a very hostile environment. Having used many types of drugs in his early teen years to adulthood, he entered the rave world, found crystal meth and used for six years. During this time he became homeless and very isolated. In his last two years of addiction he turned to crime to survive and as a way to stay off the streets. After doing repeated jail time he hit rock bottom. His health was deterio-rating quickly, and on the urging of friends he entered detox. Since then he has been rebuilding his life and giving back to the community any way possible. • Cody Gray - Cody is 17. He is an ex-addict who has been clean for about 22 months as of November, 2006. He had very rough experiences during his addiction including a psychotic experience that led to heart failure. Since he quit he's been trying very hard to give the knowledge he's gained through life experience to others. He has been acting in Forum Theatre for about two years and enjoys writing and creating music. He hopes you enjoy the show because Truth is Knowledge. • Betsy Ludwig - Betsy is a mother, grandmother, sister, aunt who is concerned with the well-being of people and believes that education is better than punish-ment, as education prevents a lot of suffering through drug and alcohol addiction. Her own experience with addicted loved ones has shown her that addictions are carried down through generations. As a mother Betsy spent a lot of time teaching life skills at home and now she spends her time in the community sharing her life experiences. She wants to make a difference in the community. Betsy was an extra in the movie Clan of the Cave Bear, and acted in Annie Get Your Gun, and Reclaiming Aboriginal Languages. She also teaches Gitxsan language and culture. • Sophie Merasty - Sophie is of the Dene and Cree Nations originating from Reindeer Lake in Northern Manitoba. Her own personal experience with a loved one's crystal meth addiction is what makes her involvement in this project much more meaningful and important. Sophie has worked extensively in the performing arts since 1983 and has performed across Canada including the Yukon. She was an original cast member of the 1992 Headlines production and tour of Out of the Silence. Her experience involves producing, directing, workshopping and developing new plays. She has also performed in film, TV, video and radio drama. Sophie is committed to making a difference in communities, particularly with aboriginal peoples, using her craft and skills in the field of performing arts. • Herb Varley - Herb is 22 years old from the Nuu-Chah-Nulth Nation. He has seen too many friends fall into the world of meth - a drug that makes people rip off their friends and that destroys relationships. He has seen people who he would never have never thought would become drug addicts go nowhere with their lives. He feels that if the Meth Project can help just one person not get involved in the drug all of the hard work that went into creation and rehearsals will have been worth it. Herb would like to say "All My Relations." • Dafne Blanco - Community Outreach Coordinator Dafne has been involved with several grassroots organizations and art groups since she arrived from Mexico in 1996. Some of these groups include Latin American Connexions, an analysis community newspaper, and Building Bridges, a human rights observer's training organization. Using her visual arts background, Dafne has put together several multimedia presentations to promote popular education on the areas of First Nations struggles, Racism, Globalization and other social issues. • Chris Bouris - Webmaster Chris is an education and communications consultant. His media work has an emphasis on civic education and democratic reform. Drawing on a multidisciplinary background which includes online video media production for the Berger Commission on Municipal Electoral Reform, Chris's media goals are to broaden community understanding of contemporary social issues and facilitate greater community participation through online technologies. He has a Cooperative Education, BFA (Film) degree from Simon Fraser University. • Tim Cardinal - Technical Director/ Lighting Designer Tim has been working on theatre in Vancouver for 18 years. He toured with Headlines' 1992 production, Out of the Silence, and is pleased to be working with Headlines again. When not plying his trade, Tim can be found watching hockey games, cheering for the Canucks. • Lincoln Clarkes - Slide Designer Lincoln is an award winning photographic designer in book, magazine and cinema. His acclaimed Heroines series is published by Anvil Press. A Bravo! documentary on the series is distributed by the N.F.B. In 2003, Lincoln created stage images featured in Practicing Democracy, produced by Headlines Theatre. Recently, Northern Electric (Universal) released a new book on Clarkes' photographic career entitled Views, with an original CD soundtrack. • Jen Cressey - Publicist Jen has been an active creator, producer, and publicist of grassroots cultural events for more than 10 years. She has produced cabarets, written comedic digital video shorts, directed Fringe shows, and performed tap dance, finger puppetry, aerial silks, clown, and acted in theatre. Being a part of the Headlines team is a great honour for Jen, who finds inspiration in their marriage of theatrical excellence with social conscience. • Jackie Crossland - Financial Administrator Jackie Crossland has many years experience in Vancouver's arts community both as an administrator and as a theatre artist. She combines her administrative and artistic skills to make a unique contribution to the organizations that she has been associated with over the years. In addition, she has been to clown school so your company is safe with her. • David Diamond - Director/ Joker David grew up in a 1950's Winnipeg home that was layered with alcohol and drug addiction. The research and development of Meth has been both a personal and professional journey. • Nicole Hawreschuk - Stage Manager Nicole is a recent arrival from Saskatoon, Saskatchewan, and is looking forward to working in the Vancouver arts scene. Nicole was stage manager and ran sound for Crystal Clear, ran lights for the Saskatoon Folk Festival, and for one season was a host for TV show Entertainment West. She is looking forward to getting more experience and is eager to learn and grow. She believes that through her experiences she is able to shed some light on this very large issue. The more people that become educated with the truth of this issue, the more Nicole believes knowledge will help bridge the gap of addiction and the social stigmas that are attached to any and all addictions. She feels that theatre is a great medium to engage and inform the public. • Jane Henry - Costume Designer Jane started her career in leather jacket design in the mid 80's and found herself drawn to costuming in theatre in the early 90's. Theatre then led to film where the bulk of her work was Assistant Costume Design. The last 2 1/2 years have taken her down a dramatically different path; that of raising her child. Meth is her first foray back into the field and she is excited to be working with such dedicated people. • Gwendolyn Matwick - Support Person Gwen Matwick is from the Fort Nelson area. She comes from the Slavey Band in Fort Simpson N.W.T. and is half Cree. She is currently living in Port Coquitlan with three of her six sons. 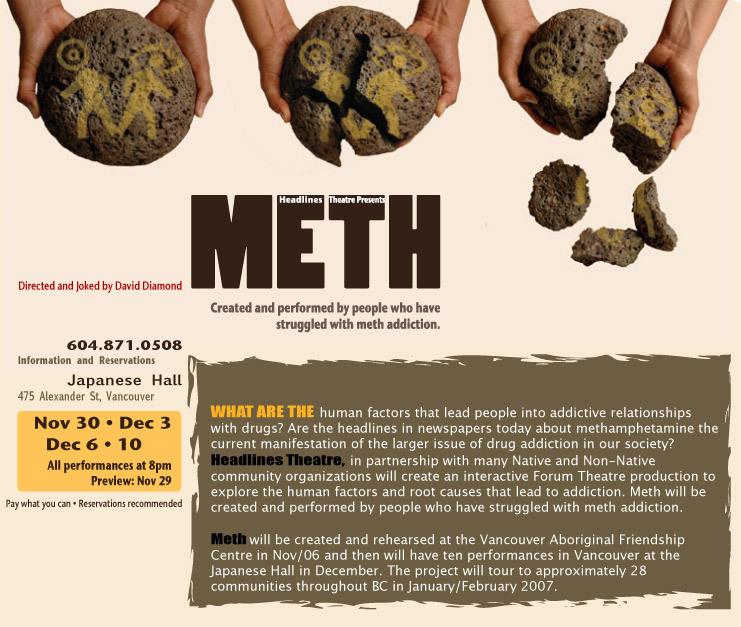 Gwen's background is in dealing with addictions and she received her education in Vancouver. She has been in and around recovery for 25 years. Gwen has a dynamic personality and always has a smile, hug or time for you. She is working on Meth because she believes that you can deal with what you know, and that knowledge is freeing for everyone. She hopes to bring light to darkness. • Yvan Morissette - Set Designer Originally from Quebec, Yvan has made Vancouver home for the last 20 years. He has worked as an Actor, Director and Stage Manager, but since his graduation from Studio 58 ten years ago, his main focus has been designing sets for theatre. His work has been seen on most stages around Vancouver, including the Vancouver Playhouse, the Arts Club Theatre, Bard on the Beach, Touchstone Theatre, Electric Company, Neworld Theatre, and Headlines Theatre, where he has previously designed THIR$TY. His designs have been nominated 10 times for Jessie Richardson Awards. His work will also be seen this year in productions for Rumble, Touchstone Theatre, the Push Festival and the Belfry Theatre in Victoria. • Mumbi Tindyebwa - Production Manager Mumbi has a diverse range of experience working and volunteering both in the Arts and in community organizations in Canada and East Africa. While pursuing her Bsc in Human Biology at the University of Toronto, Mumbi volunteered as Writer and Editor for a campus newsletter, acted and directed in campus productions, and managed a local record company to promote upcoming urban artists in Canada. Before joining Headlines in January 2006, she spent ten months in Uganda on a CIDA internship working as an HIV/AIDS Education Officer. There, she combined her artistic and scientific background to teach youth drama groups how to use forum theatre to raise awareness in rural communities. • Robyn Volk - Crew Person Robyn has been working in theatre for many years and in different capacities. She enjoys making props and costumes, set painting, stage managing and being a running crew member. Most of her time is spent working at The Arts Club Theatre but she also works with Radix, Vancouver Opera and most recently on the Ghost Train of Stanley Park.